Kolkata is famous for its street food. And the most famous street food is "Egg Roll". 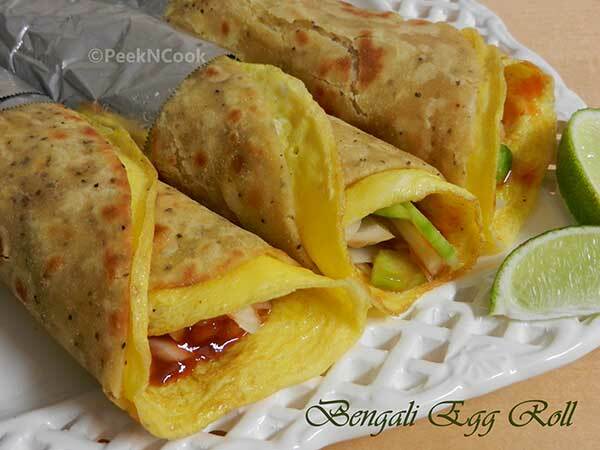 There is no people who does not like "Egg Roll". Its a famous snacks for every Kolkatans. And specially in Durga Puja this snacks is the most favorite for every one. Easy to make and tastes awesome. Make a soft dough with maida, atta, some salt, 1 teaspoon oil, baking powder & warm milk and keep aside for 15 minutes. After 15 minutes divide the dough into 4 equal parts. Take one ball and roll it gently into a thin large circle with little atta . Sprinkle some oil, some maida & some black pepper on the circle and pleat the roti and fold like in & out way. Then stretch a little bit and roll into spiral. Then keep the spiral aside covered . Repeat this process for the rest dough balls. Keep it covered for 1 hour. After one hour roll out the spiral into medium size disk. Heat the tawa and fry gently each medium size disk and keep in a covered container. Now take an egg and beat well with some salt. Heat little oil on a pan and pour the beaten egg on the hot pan and spread the egg all over the pan and keep it as it is on heat for 30 seconds and after that place a paratha on the raw side of the egg and it will stick with the egg. Flip the paratha with the egg and place on a plate. Now on the fried egg topped paratha sprinkle some lemon juice, put some chopped cucumber, onion, chili, Tomato ketchup & chili sauce Roll up the paratha with the vegetables in the center. Wrap up the roll into a paper towel. Repeat this whole process for rest of the parathas. To make this in a healthy way, make the chapati with atta dough & use the egg-white only.